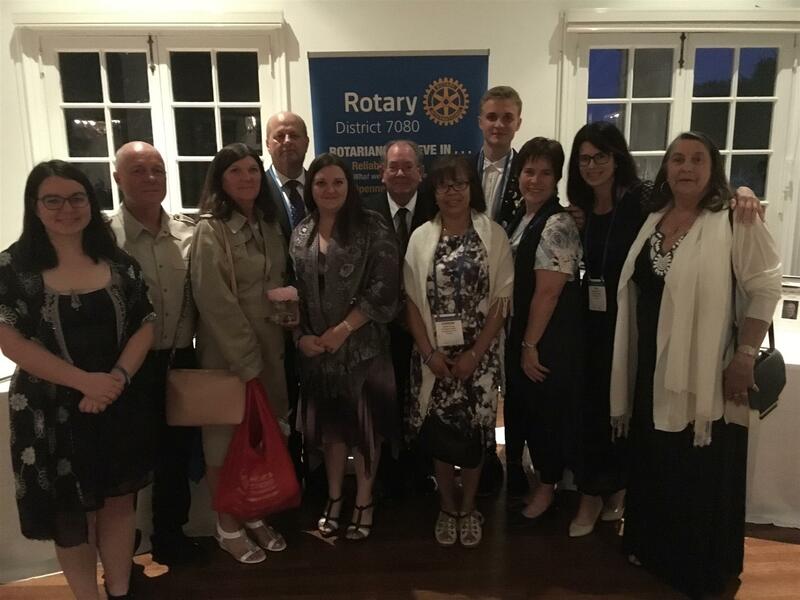 Fellow rotarians from The Rotary Club of Georgetown attended the Rotary Annual District 7080 Changeover and Awards Celebration Dinner on Saturday June 23 at the fabulous Royal Canadian Yacht Club on the Toronto Islands. This was a once-in-a-life-time opportunity to visit this unique and beautiful venue with its spectacular view overlooking the city skyscape. A group photo truly embraces the occasion and spirit of "Be the Inspiration" the theme of the 109th Annual International Rotary convention at the Toronto Metro Convention Centre, Toronto on June 23–27, and brought over 24,000 Rotary club members world-wide . 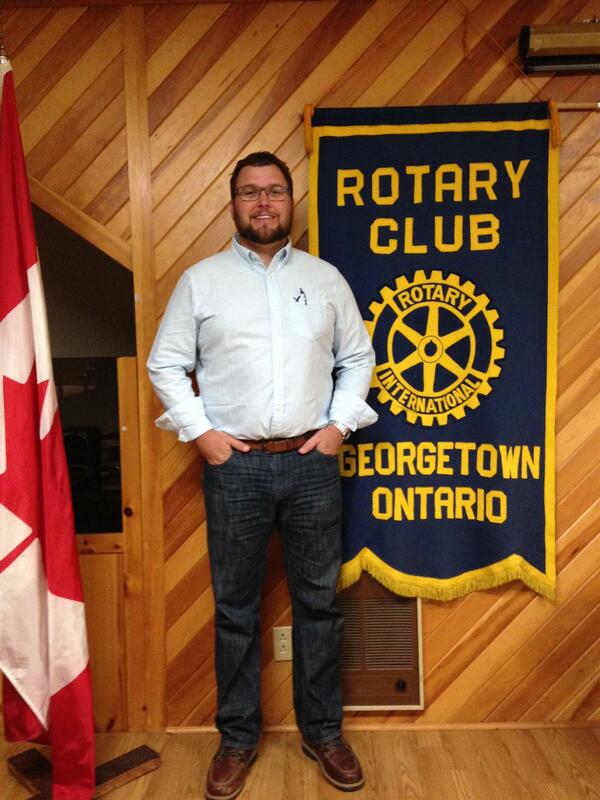 The Georgetown Rotary Club held a formal President Handover Ceremony to celebrate current President - Peter Zavitz. 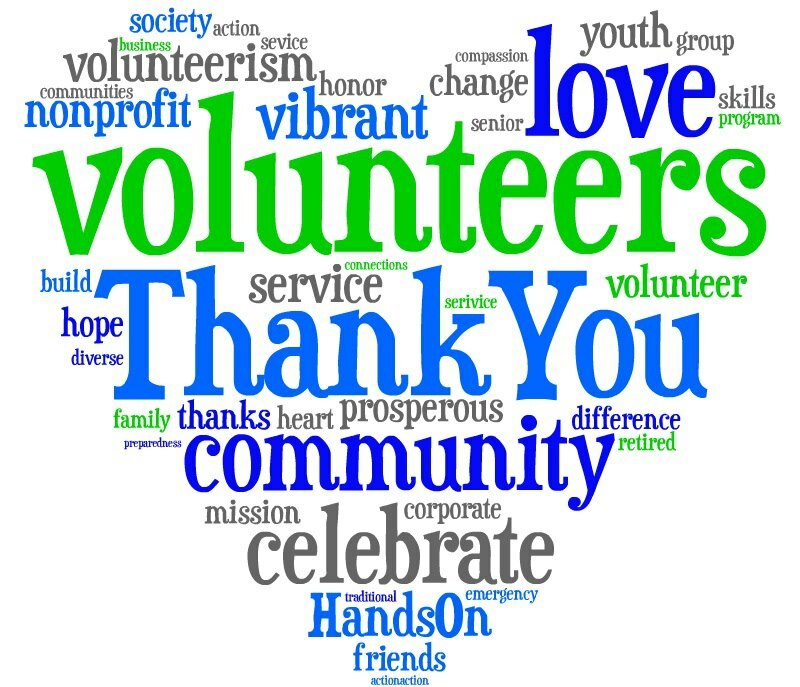 Peter reflected on the past year and the contributions made by rotarians to the community, in addition recognizing many new members who have joined the club and the new energy that brings. The evening then transitioned to welcome incoming President - R.J. McLaughlin for upcoming 2018/2019 term. Welcome RJ! Welcome to our new President Matt! Welcome to Matt, our president for 2015-2016. We know you'll be great! On February 21st, the Rotary Club of Georgetown, celebrated our 60th Anniversary at the Club at North Halton. Thank you to John Discenza for being a wonderful Master of Ceremony, and to our other speakers Barry Timleck, Barry Edington and Ave Edington. We also were congratulated by The Honourable Michael Chong, MP and Councillor Jane Fogal. 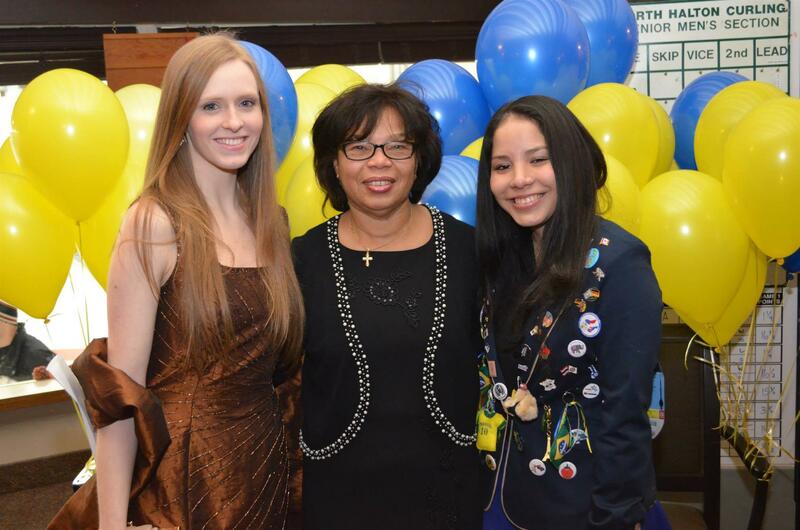 President Doreen Govas (centre), with Katie (outbound exchange student to Brazil) and Tamara (our inbound exchange student from Ecuador). Have You Seen the Posse? 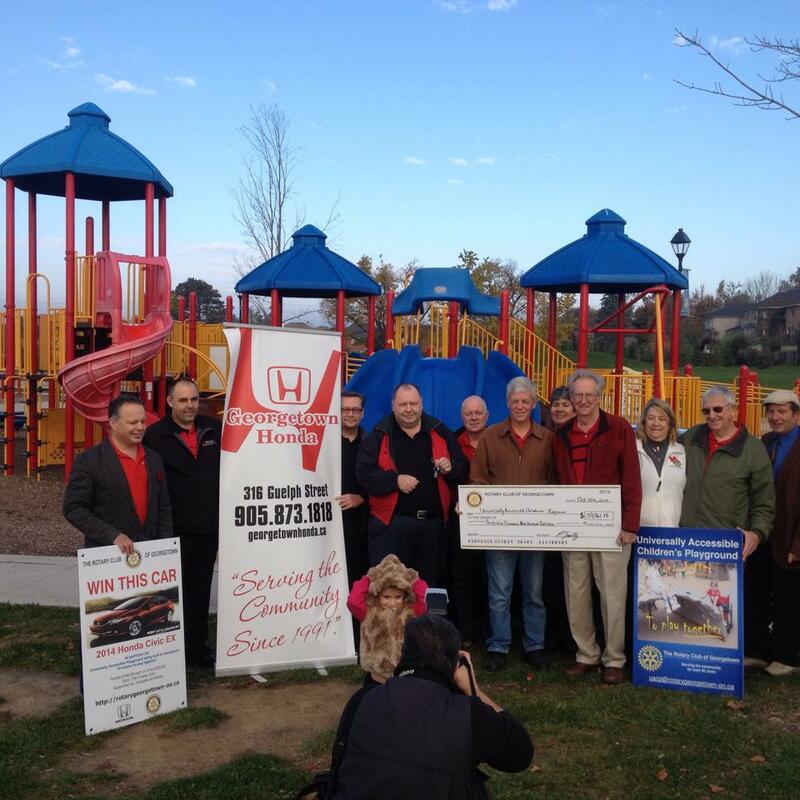 Michael Hope, winner of the Honda, is joined by many of the Georgetown Rotarians and Halton Hills Mayor Rick Bonnette for the presentation of the car at Dominion Gardens Playground. Included with the presentation of the car is also a cheque of the proceeds from the raffle for almost $40,000. Congratulations to everyone! With this draw, everyone was a winner! 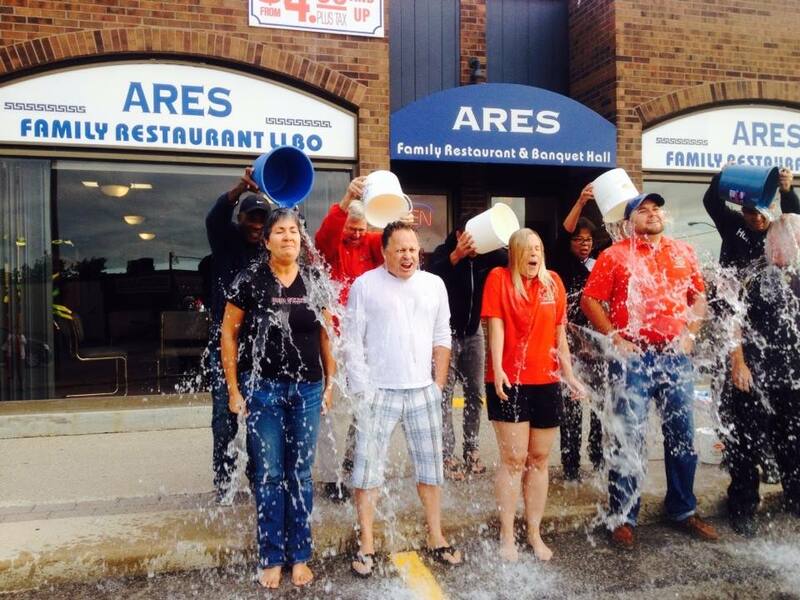 The Rotary Club of Geprgetown accepted the ice bucket challenge this chilly morning and challenges the Rotary Clubs of Acton and Milton along with the Literacy North Halton to take the challenge. Welcome to our new President Doreen! Welcome Doreen Govas as President of the Rotary Club of Georgetown. It's going to be a great year! Our theme this year is Light Up Rotary and we know Doreen will light a fire under us with her energy and enthusiasm! Canada Day in the Glen! Come out to see us at Canada Day in Glen Williams. We'll be in the parade with 2 entries - for the Car Raffle and for Hope in High Heels. We'll also be selling our famous Montreal Smoked Meat sandwiches to support the food bank! 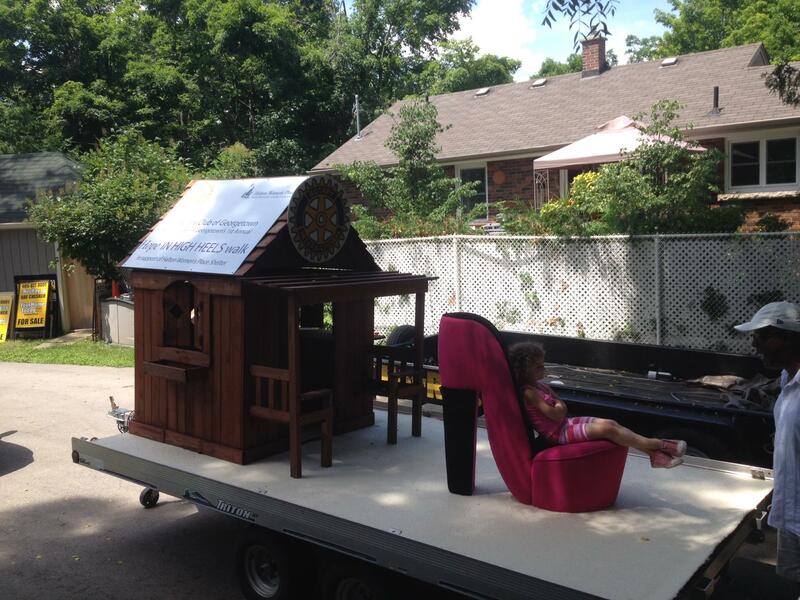 Watch for our float in the Canada Day Parade in Glen Williams. You still have time to register for 'Hope in High Heels' a (really short) walk to support Halton Women's Place. Don't like to walk in high heels? Just sponsor someone to support the shelter. Visit our website page for walk registration link and info! Mohawk Race Night a Success! Thank you to all the attendees of our super successful Mohawk tri-club race night. Special thanks to Leslie for organizing the event and to Peter for keeping track of all the people! 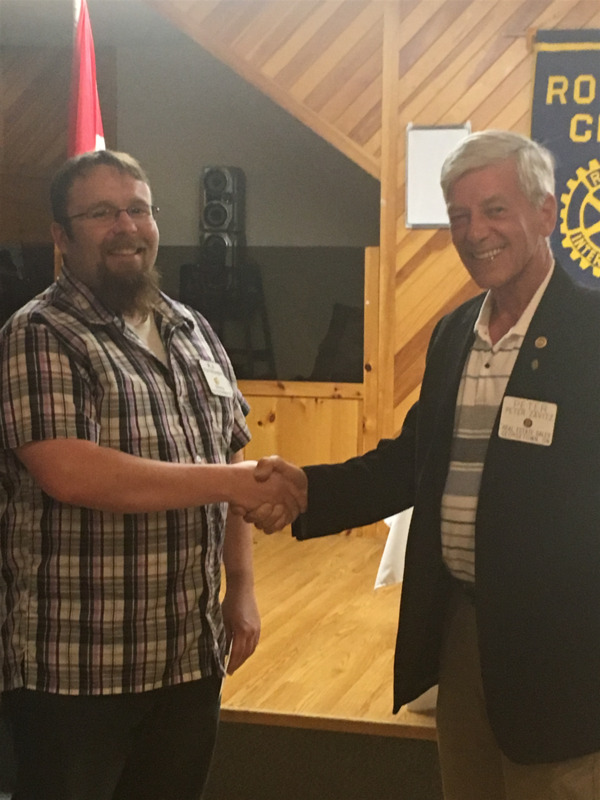 Dave Heydon was our guest speaker this past Friday to update us on the Chase the Dream Motorcycle Ride and Show. 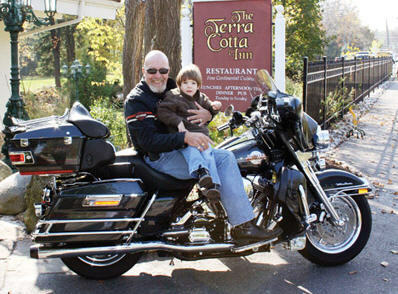 Friends and motorcycle buffs will gather at the Terra Cotta Inn on Sunday, August 24, 2014 for a motorcycle ride in support of a local youngster who suffers from cerebral palsy. The Ride and Show will start at 11 a.m. (registration is at 9:30 a.m.) with riders departing from King Street for a ride through the Caledon hills. Paul gave our members some pointers on a good swing and we learned about the great corporate and party packages they offer, including mini-golf! Stay tuned for a club outing and join us! Mr. Bill Stensson, CEO Sheridan Nurseries presented to our club last week, celebrating Sheridan's 100th year in 2013. From their modest beginnings in 1913, Sheridan has nine modern garden centres in the GTA and DW areas. One of the most interesting green initiatives is that drip irrigation has replaced sprinklers & broadcast watering reducing water consumption by up to 80%! At Sheridan, a leader means more than being the most successful or the most on-trend. It means anticipating their guests needs to improve their experience while setting an example in corporate social responsibility. They have designed an Environmental Plan that will see changes at their offices, farms and garden centres as part of a long-term commitment to environmental responsibility and sustainability. Visit the Sheridan website 'Green Initiatives' here. Mr. Stensson was also a Rotary Group Study Exchange participant some years back! Rotary is everywhere! Alex Hilson provided our Club with an update on current uses and future plans for social media. Stay tuned for Alex's upcoming lesson on Facebook! As Alex said, "some of you have been Rotarians for 45 years, imagine all the great experiences you have to share!" Let's get the word out to everyone on how great Rotary is in our lives, and could be in their lives and the lives of people in our community. 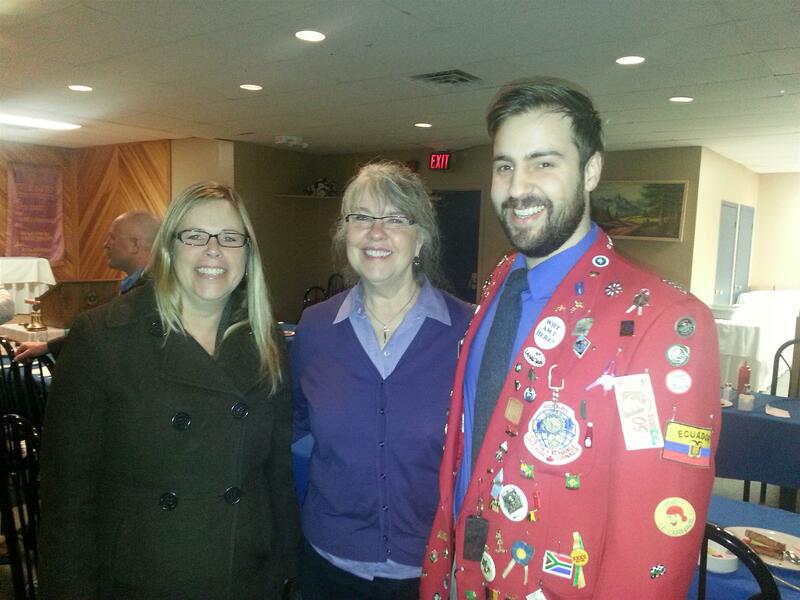 Photo: President Linda Zammit, Linda Discenza and Nick Discenza in his original Youth Exchange jacket! 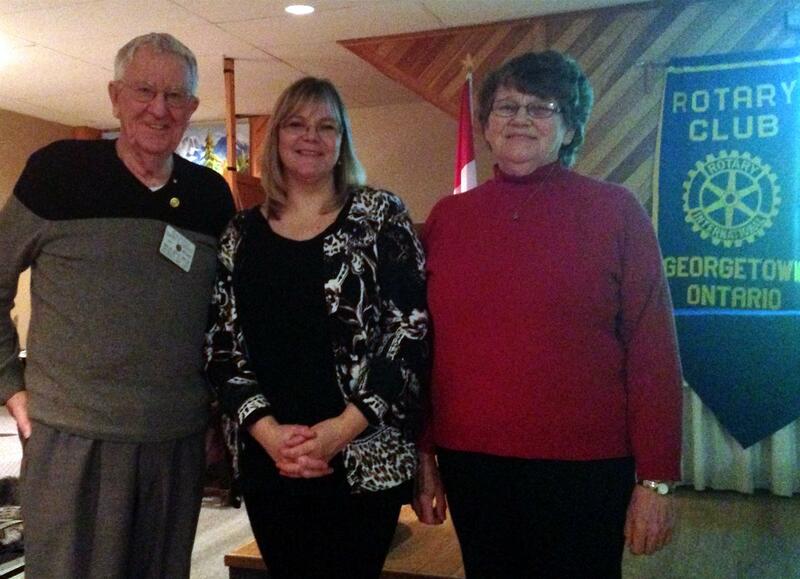 Thank you to Jane, Sandra and Barry for sharing their experiences while in China. The presentation was fantastic and showed us history, modern day life and aspects of Chinese culture. We also noted that Barry made it to the top when climbing the great wall, with some fanfare! The Rotary Club of Georgetown was sponsored by the Rotary Club of Guelph and received its charter on February 17, 1955. In February 2015 we will celebrate the clubs 60th anniversary. Its first major project was the Seniors Citizens Dinner. In 2005 the Club received recognition from Rotary International for its annual Seniors Dinner held consecutively for 50 years, the longest running charitable event in the 100 year existence, at that time, of Rotary International. We have held what is now called, the “Norm Bigg” Senior Citizens Dinner” for 58 years continuously.